‘Off-the-shelf’ training and development programmes do not address the unique needs of organisations. Potencium’s customisation process includes pre-course interviews, questionnaires and team meetings, as well as both short- and long-term follow-up to ensure that the client’s objectives are achieved. Programmes can be delivered in many languages both on-site and online. Just as no two organisations are the same, no two Potencium programmes are the same. We pride ourselves on creating instruction, discussions, practical exercises and course materials that are appropriate to the client’s specific needs. 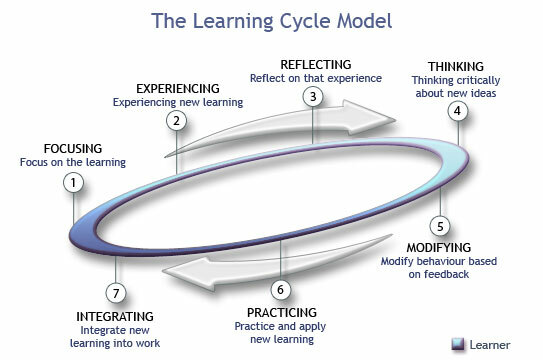 According to the NTL Institute for Applied Behavioral Science (USA), while people remember just 5% of what they hear in a lecture, they retain up to 75% when they learn by doing — a process described by the Learning Cycle Model below. Potencium provides theoretical literature for each participant to read, which combines the latest research and information from a wide variety of books, articles, interviews and other sources. Based on the course specifications of the client, this “delegate pack” is specifically produced to supplement each topic covered in the training sessions. Potencium designs case studies that depict real business climates and demonstrate specific learning objectives. We also design practical exercises and assignments that allow participants to reflect on the lessons to be learnt. Potencium utilises a variety of tools to assess the current situation of an organisation as well as the qualities, attributes and needs of its employees. Please visit Assessment Tools for a complete description of the International Profiler, Team Trust Indicator Instrument, GlobeSmart, DiSC Classic Personal Profile System, Thomas-Kilmann Conflict Mode Instrument and the International Conflict Style Inventory. After completing an assessment instrument, Potencium analyses the responses and prepares a detailed report of the individual or team’s overall results. This report includes useful suggestions for improvement that can be implemented to achieve optimal results. Potencium designs innovative classroom simulations that involve practical group work. During the simulation, participants must achieve a common goal within a limited amount of time. These simulations have proven to be highly effective activities from which participants obtain valuable decision-making, teamwork, and leadership insights. Potencium engages the services of professional actors during live training programmes. Participants witness various enacted business scenarios that are specifically scripted to demonstrate particular learning points and to encourage discussion. Potencium consultants have written and presented several keynote speeches for businesses, educational organisations and governmental agencies. Keynote speeches are individualised, interactive and highlight the most advanced and up-to-date research available. Potencium was asked to compile a collection of cultural stories written by employees who participated in our “High Performance Distributed Technical Teams” online courses. These students, from countries all over the world, were asked to describe an object that related to their cultural background. A selection of these stories was published and distributed internationally throughout the company. Potencium created an award programme for employees who demonstrated exceptional skill in leveraging technical capabilities and promoting an intercultural community. Potencium developed the award criteria as well as the submission process.